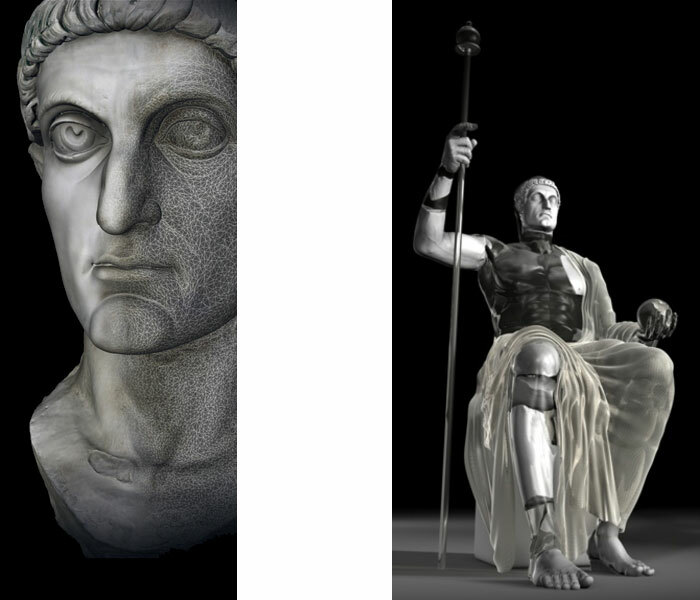 The Colossus of Emperor Constantine – 3D documentation, reconstruction and 1:1 replica in marble. 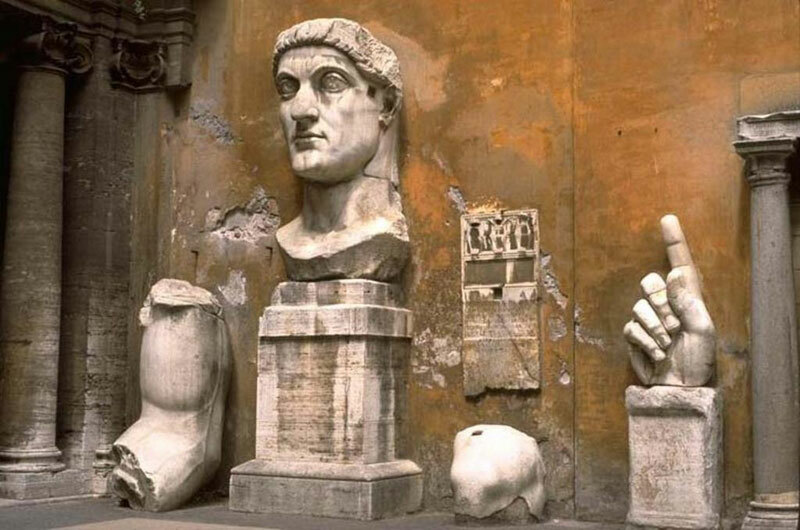 The Roman Emperor Constantine went down in history as a precursor of Christianity as well as a unscrupulous politician (307-337 AD). His famous 3m high colossal portrait in the Capitolinian Museums Rome is one of the most visited and depicted portrait of Ancient Rome. The head once set on top of a sitting statue od app. 12m in height, which is only preserved in further monumental fragments. It once stood in the Maxentius Basilica on Via Sacra between the Forum Romanum and Colosseum. Due to the fame of the head, it should also have been seen in the Constantine State Exhibition in Trier 2007, but was not allowed to leave Italy. Because of the fragility of the marble surfaces, a traditional moulding with silicone rubber was out of the question. After an intensive planning with Dr. Eckart Köhne in 2005, the high resolution 3D-documentation of all fragment with a structured light scanner could be carried out in 2006 in Rome. In close cooperation with Dr. Claudio Parisi-Presicce of the Capitolinian Museums, the fragments were modelled with the computer and checked unter static characteristics. With reference to antique sources, they were then positioned to put together to a reasonable reconstruction proposal with multimedia visualisation. 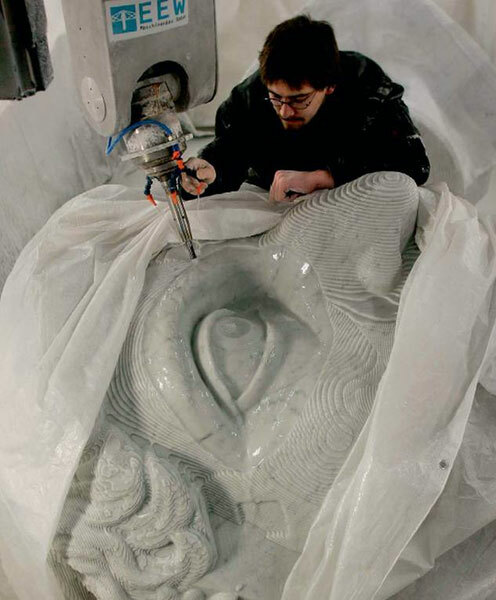 In a further project step, a process chain was developed with cooperating companies (Prometheus, Frankenschotter, EEW, Delcam), in order to rebuild the colossal head 1:1 with latest milling technology out of a 25t Carrara-marble block. The elaborately milled result was finally corrected and patinated by a traditional sculptor, in order to get as close to the original as possible.